Guillaume Corneille (Liège, Belgium 19222010 Auvers-sur-Oise, France) was a Dutch painter, sculptor and poet committed to Neo-Expressionism. Together with Karel Appel and Constant Niewenhuys, Corneille (actually Guillaume Cornelis van Beverloo) was a member of the artist group Reflex and later founded the artist group CoBrA. These artists strove to break with the traditional understanding of art in order to be free to move in a kind of creative fantasy world. 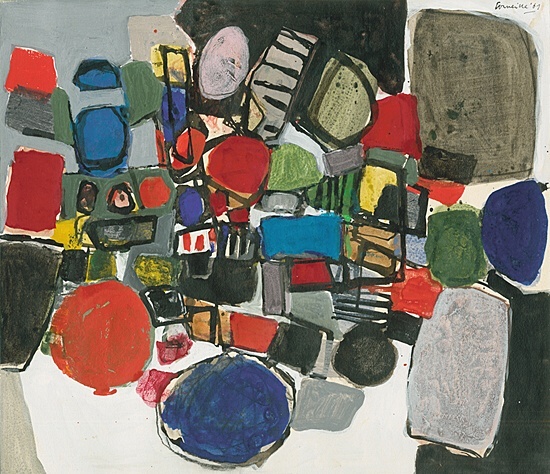 Corneille made numerous trips to Africa, Asia and South America, which strongly influenced his works and were reflected in strong colours and the reduced structure of perspective in his later works. Until his death, he used the recurring motifs of the woman, the bird and the palm, which he brought back from Cuba in the form of inspiration, as enduring symbols. He participated twice in the documenta, and his works can be found in, among others, the Stedelijk Museum in Amsterdam and the Cobra Museum of Modern Art in Amstelveen.